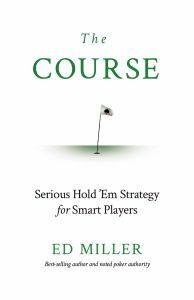 The Course is different from other poker books you may have read. It’s written for players who are smart and who know that to succeed, you have to be different. Because in poker, if you play and think like everyone else, you’ll also get results just like everyone else. There’s a saying in the golf world that you don’t worry about the other players. You just play the course. It doesn’t matter if you’re playing in a big tournament against a hundred other players or against just one. It doesn’t matter if you’re playing against Tiger Woods or against Woody the Woodpecker. You can’t control what they do, so they can only be a distraction. All that matters is the course. And the only thing you can control is how you play it. This is a powerful idea, and it applies just as well in poker. Poker is full of distractions, and most players get hung up worrying about all the wrong things. The things they can’t control. The things that ultimately don’t matter.